Code for Canada, a new not-for-profit that aims to modernize digital services at all levels of government launched in Toronto on April 5, 2017. It’s exciting news for anyone (read: everyone) who gripes about having to do any government-related tasks, whether it’s paying a parking ticket or applying for a permit. Their hope is to create an easier, more user-friendly experience for all. It’s the first of its kind in Canada, though there are more than 10 countries already involved in the “Code for” model of civic technology. The Ontario government is the first to contribute $700,000 to funding the project, while private companies such as Shopify and Normative have also contributed to the initiative. What’s great about Code for Canada is that it also gives work opportunities to Canadian technologists and designers in the form of 10-month fellowship programs. 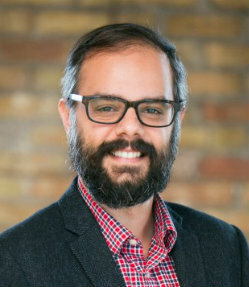 CFC alumnus Gabe Sawhney (TELUS Interactive Art and Entertainment Program, Interactive Project Lab) is the executive director at Code for Canada and helped launch the organization. Here, he talks about its inception and the challenges of design technology for governments. Your professional pursuits have mostly been in technology and innovation. What inspired you to follow this path? Gabe Sawhney: My work has varied from technology to design, innovation, consulting and now civic tech. I found technology to be really fascinating since my youth and have always sought out opportunities to apply it in ways that were meaningful — with storytelling, with community work, and now increasingly with social causes and government. Code for Canada is the first of its kind in the country. How did the idea come to be? Sawhney: Code for Canada is inspired by similar organizations in other countries. Code for America was the first. It started in 2009 and there have been many others. We’ve been really inspired by the work that those organizations have done to help connect government innovators with the tech and design community, and we felt it was time for a similar initiative in Canada. In your opinion, which countries have been really successful at making big changes? Sawhney: What’s interesting is that each of the organizations take a slightly different approach because they’ve adapted the model for their context and country. Code for America has been around for a long time and they really got things rolling with their fellowship program and their Brigades (i.e., community volunteer) program. That model has been adapted in different ways in different countries. For instance, Code for Japan has a really different Brigades program with a lot of private sector support. Code for Pakistan has a really successful fellowship program, now in its third or fourth round. One of the newer ones is Code for Romania — they’ve grown very quickly and have tapped into the Romanian diaspora. Because there are so many Romanian technologists who are working in other parts of Europe, it’s a really interesting case in that a lot of their activity takes place outside of Romania. Do you think there are more risks or challenges involved in working with government technology? Sawhney: It’s interesting — non-profits are in a similar situation to government in many ways. They’re always trying to do more with less in terms of resources and, historically, have had a lot of challenges related to technology. There’s definitely a strong need and interest from the non-profit community and that’s something we’d really like to look into in the future, whether it’s Code for Canada or a different program. You’re also the co-founder of Civic Tech Toronto, which hosts many events for people interested in civic technology. What’s one of your favourite things about the organization? Sawhney: One of the things I like about Civic Tech Toronto and civic tech communities in general is the way they create a really welcoming environment to people with a whole range of skill levels related to technology and design. A lot of people are in the learning stages and developing their skills around those things, but they all share an interest in the potential for how technology and design can have a positive impact in our communities. As a result, it attracts a very diverse set of people in terms of their backgrounds, their experiences and skill set, and the sectors and industries in which they work. To learn more about Code for Canada’s community network and fellowship program, visit codeforcanada.ca.